The unanimous declaration of the thirteen United States of America, in Congress, July 4, I776. The Oregon Patriot Party presents this side by sidereference to the plain meanings within this document which are ever increasinglybeing ignored by our government. Words and their meanings have been presentedas well as factual references and insights. When, in the course of human events, it becomesnecessary for one people to dissolve the political bands which have connectedthem with another, and to assume among the powers of the earth the separateand equal station to which the laws of nature and of nature's God entitlethem, a decent respect to the opinions of mankind requires that they shoulddeclare the causes which impel them to the separation. The document begins by acknowledging there willbe times when it will be necessary for a people to break away from a formof government. To assume the powers of independent nations as "States" andpeople. To become and be respected as equal nations as "States" - See 37 and 39 Grievances Below.That it is a natural succession entitled to them by the laws of nature andof God. That with respect to views and opinions of all mankind they believeit decent and a self imposed requirement that they present the reasons forwhich they feel it necessary to separate from their home country. The Right to Separate. 1. Requiring no proof or explanation. That all men are created equal; that theyare endowed by their Creator with certain inalienable rights; that amongthese are life, liberty, and the pursuit of happiness. 2. Sure to come or happen; inevitable. 3. Established beyond doubt or question; indisputable. 1. That cannot be transferred to another or others. 1. Conforming with or conformable to justice, law, or . morality. 2. In accordance with fact, reason, or truth; correct. Meaning that there are more inalienable rights than are being immediately mentioned. Theopposite meanings of those 40 Grievances presented in this document whichdefine what freedom is not, are also inalienable rights. Later,the Bill of Rights outlined more of these inalienable rights. (The Bill ofRights are derived from early individual rights established in England butexpanded to true and greater defined absolute rights in America). To live where and how one wants to live so long as it does not physically injure another person. 2. Freedom from unjust or undue governmental control. 3. A right and power to engage in certain actions without control or interference. a. The act or an instance of chasing or pursuing. b. The act of striving. c. An activity, such as a vocation or hobby, engaged in regularly. Our Government is created to protect these rights. That any power a government has is there only with the consent of the people. Thisdoes not give the people or the government the power to change or abolishinalienable rights which cannot be given away, taken away, sold or transferred. that, whenever any form of government becomes destructiveof these ends, it is the right of the people to alter or to abolish it, andto institute a new government, laying its foundation on such principles,and organizing its powers in such form, as to them shall seem most likelyto effect their safety and happiness. Rightswhich make a government ask consent of the governed for which this rightof altercation or abolishment is granted. They are describing here why theyare separating and setting the stage for that what it is that will be mostlikely to effect their safety and happiness. 1. To change or make different; modify. *Note that only 38 Patriot villagers ran out and faced the largest governmentin the world at that time; facing 700 British Regulars across Lexington Bridge. Of the 38, 8 died and 9 were wounded. The British under direction of General Gage then went on to destroy citizens militia supplies at Concord. Neitherthe British Government at that time nor our own Federal government likesarmed civilians equal to the strength of the standing army. Yet, this isthe reason for the 12th Grievance which defines the 2nd Amendment - see below. 14 of Gages men were lost in the following skirmishes after the supplies were destroyed at Concord. Farmerseverywhere though outnumbered took to their guns and chased after the Britishwho were reinforced by 1200 more men and field pieces (cannon) and the battleintensified until the British found safe haven in Charlestown. The Britishsuffering 247 casualties to the Colonists 88. True Patriotism is not defined in numbers but in those who is willing and will to defend Certain, Inalienable, Rights. Prudence, indeed, will dictate that governmentslong established should not be changed for light and transient causes; andaccordingly all experience hath shown that mankind are more disposed to suffer,while evils are sufferable, than to right themselves by abolishing the formsto which they are accustomed. Much consideration should be taken before changinga government that has been in existence for a long time; and never changedfor causes that are unimportant or that will change easily with time. Historyhas shown that man is willing to be beat down a long time with regulationsand abusive laws of a government before they get mad enough to to take stepsto change it; or courage enough to fight and overthrow it. This is becausethey become accustomed to the misuse, rendering themselves lazy, unfocussedand passive. However, when after many abuses have been sufferedwhich indicates that such a government will continue to misuse its powersand ignore those inalienable rights and rule with oppressive power. Itis each individual's or group of individuals RIGHT and DUTY to over throwthat government and to create safeguards to protect themselves from the samemisuse occurring in the future. This includes the Federal Governmentand Constitution if it becomes degraded to a point that is contrary to theDeclaration of Independence which is the lone document that defines freedom.Theorigionating founders letters providing further the intent. Thousandsdied for this document alone; no one died to ratify the Constitution. Also,the Constitution would have never been ratified without the Bill of Rightsthat are the ``Among These" defined in the Declaration of Independence defining``Life, Liberty and the pursuit of happiness. 1. To seize and hold (the power or rights of another, for example) by force and without legal authority. 2. To take over or occupy without right. 3. To seize another's place, authority, or possession wrongfully. To show or demonstrate clearly; manifest. 3. A tyrant or those collectively with unlimited power or authority. Our countries reasons for seeking independence. The history of the present king of Great Britainis a history of repeated injuries and usurpations, all having in direct objectthe establishment of an absolute tyranny over these states. *** Although the following complaints by the Colonieswere aimed toward the king of England, you can see that some of the problemsthey faced then are not so unlike the problems we are facing right now withan oppressive federal government. Remember, it doesn't matter whata controlling oppressing power is; as it can be a king, a dictator, a bureaucracy,a socialist structure, a democracy, a republic; It means very clearly "any government", any form of oppressive power. Foreignpolicy, immigration and foreign armed forces not so unlike the U.N. (unitednations), Federal armed forces and civil militias are also easily relatedin the Grievances and described clearly. *** Below we haveoffered correlation's between what was then a reason to become independentand present day problems needed to be corrected. We have numbered the reasonsfor ease of reference. 1.) To prove this, let facts be submitted to a candidworld. He has refused his assent to laws the most wholesome and necessaryfor the public good. 1.) Here again our founding fathers are proposing to set down laws that will be wholesome and necessary for the public good. 1. Conducive to sound health or well-being; salutary. 2. Promoting mental, moral, or social health. 3. Enjoying or marked by physical, mental, or moral soundness; healthy. 2. Needed to achieve a certain result or effect; requisite. 3.a. Unavoidably determined by prior conditions or circumstances; inevitable. b. Logically inevitable. 4. Required by obligation, compulsion, or convention 5. Something indispensable. 2.) He has forbidden his governors to pass lawsof immediate and pressing importance, unless suspended in their operationtill his assent should be obtained, and, when so suspended, he has utterlyneglected to attend to them. 2.) Here we have been given an example of localgovernments whose serious immediate needs are being ignored or suspendedby a higher oppressive power until that power gives its approval. States Rights and Local Rights to Pass Local Laws are an Inalienable Right. 3.) He has refused to pass other laws for the accommodationof large districts of people, unless those people would relinquish the rightof representation in the legislature; a right inestimable to them and formidableto tyrants only. 3.) Here the king try's to keep any opposition tohis rule by only allowing people into its domain if they give up their rightto have representation in the legislature or voice in the law making process. Zoningis another way of refusing accommodation of large districts of people andis completely against the rights of the people who have a right to buildand live where they wish. Another reason that our Rights cannot be given up or even given or traded away! 1. Impossible to estimate or compute. 2. Of immeasurable value or worth; invaluable. 4.) He has called together legislative bodies, atplaces unusual, uncomfortable, and distant from the repository of their publicrecords, for the sole purpose of fatiguing them into compliance with hismeasures. 4.) The reason for have law libraries and places of records in every major city. However,there are federal records for federal agencies that are almost impossibleto access freely or obtain cost effectively: the Bureau of Land Managementamong others who's records you have to ask them to get for you so you mustknow exactly what you are looking for; and are unable to research all copiesof their records freely. An agency that needs to be dissolved anyway andlands given to each states local county control. BLM also has their own courts in Virginia that determine the outcome of their own administrative law. Stateand Federal "Administrative law" now causes people to travel hundreds ofmiles for "pretrial hearings" long before the actual trial and far from thearea of where the issues are occurring, thus fatiguing those that need todefend themselves or their position and creating great difficulty to a proceedingthat will be given great weight at a eventual trial. 5.) He has dissolved representative houses repeatedlyfor opposing with manly firmness his invasions on the rights of the people. 5.) Here the king try's to keep people fromorganizing and representing themselves against him for his actions againstthe peoples rights by using force. 6.) He has refused for a long time after such dissolutionsto cause others to be elected; whereby the legislative powers, incapableof annihilation, have returned to the people at large for their exercise:the state remaining, in the meantime exposed to all the dangers of invasionfrom without and convulsions within. 6.) Basically, after such dissolving of representatives,the king delays the election of others, meanwhile those powers or laws theywish to have removed, changed or be protected from, return to take what theywant from them (convulsions from within); and kept from any representationthrough the legislative process to receive adequate protection from theirenemies (invasion from without). The reason for the 12th Grievance and 2ndAmendment. 7.) He has endeavored to prevent the populationof these states; for that purpose obstructing the laws for naturalizationof foreigners; refusing to pass others to encourage their migration hither,and raising the conditions of new appropriations of lands. 7.) Here the king tries to keep people out of thiscountry and from entering the states by not granting naturalization and raisingthe cost and creating costly and difficult procedures or conditions to obtainland or properties. It is also just one more reason why Zoning of land which restrict the libertyof building and living where one wishes is unconscionable and unconstitutional. It is regulation that keeps jobs from this country, not immigration. Lift all zoning and there would be no unemployment. hither and thither or hither and yon. In or to many places; here and there. Note:Building codes for publicly owned buildings and Emission controls for companieswhose pollution leaves its property into the public would not be restrictedfrom being laws regulating them. This is an area of special considerationwhich will be addressed at length later on in this web site where we discusswhere Rights of one are not Rights to encroach upon another. 8.) He has obstructed the administration of justice by refusing his assent to laws for establishing his judiciary powers. 8.) Simply, the king refused to agree to anyonecreating laws that would establish any kind of guidelines or firm rules tohis powers. 3. To agree, as to a proposal; concur. 9.) He has made judges dependent on his will alone for the tenure of their offices and the amount and payment of their salaries. He controlled alljudges by controlling their salaries. Appointed judges can face similar biasesif they are appointed. However, if they are educated in both law and thelaws of freedom as presented by the founding fathers in the Declaration ofIndependence, such biases should be very limited by just reasoning. 10.) He has erected a multitude of new offices andsent hither swarms of officers to harass our people and eat out their substance. 10.) Here the king has created massive bureaucracy just as we see in our country today. Officeswe do not need. Enforcing laws on us we don't need; And ``eating out oursubstance", our hard earned money, to pay for their high salaries, insurance,dental, doctor and retirement! Then they have the gall to ask for fees for their services! Butfor the armed forces, police and fire. All else is welfare, should be paidaccordingly and limited to four years service to the public. They would then have that training to use toward work and position in the private work place. ***This is why we need to put a freeze on government employee hiring and beginshifting jobs from nonessential government offices to essential governmentoffices as openings become available. *** At the same time, declareZoning, as it is in fact, unconstitutional. This will open the way for privatejobs through private enterprise. 11.) He has kept among us, in times of peace, standing armies without the consent of our legislatures. 11.) This is not an issue in our country but for the lack of local control over federal policing agencies by local legislature. It does cement the fact that Federalism was hated by the original founders. The"federalists" created, after freedom was won for free and independent states,a condition that was sure to create the very same problematic issues of alarge central government they had just wrestled freedom from. Only later was federalism ``debated" by a few who forgot what they fought against to gain their freedom. Legislatures were independent of the kings court and independent of each state or area. This(local control) desperately needed now, would reduce some public tensionsfrom unwarranted federal policing tactics which should be left outside ourcountry for socialists, communists and other enemies to a truely defined free society based on these inalienable rights. 12.) He has affected to render the military independent of and superior to the civil power. 12.) Here is a powerful statement of our ForeFathers that the civil power should be equal to or greater than the militarypowers. Most importantly, it defines the difference of the two. This can be no plainer. Lets look at what these words mean. 1. Of, relating to, or befitting a citizen or citizens. 2. Of or relating to citizens and their interrelations with one another or with the state. 3. Of ordinary citizens or ordinary community life as distinguished from the military or the ecclesiastical. 4. Of or in accordance with organized society; civilized. 5. Sufficiently observing or befitting accepted social usage's; not rude. 6. Being in accordance with or denoting legally recognized divisions of time. 7.Law. Relating to the rights of private individuals and legal proceedingsconcerning these rights as distinguished from criminal, military, or internationalregulations or proceedings. Note: Because the national guard is controlled by the federal government and paid as a reserve force it is not a civil power as defined or practiced. It is an extension of the standing army. 1. Of, relating to, or characteristic of members of the armed forces. 2. Performed or supported by the armed forces. 3. Of or relating to war. 4. Of or relating to land forces. 6. Members, especially officers, of an armed force. 13.) Here the king has joined with others to place the colonists under the jurisdiction of those he has conspired with. Thismakes it very clear that no laws but our own shall govern our country. Andthat States (colonies) rights they possessed not be subject to far removedpowers. Laws imposed on the United States by any UN chartersare unconstitutional and directly in conflict with the Declaration of Independence. The federal government by its relentless defiance of the founding documents intent of this document which is a Engagementof the people and allowance of financial gain as well as outside interventionswith the same corruption is now practicing this same pretended legislation. 14.) Self explanatory. Remember, these were British citizens whose own government placed a standing army among the citizenry. Thiswas a reason to over throw their government. Think about this, then readthe 12th grievance again. This further defines the rights of individual citizensto be in their right to keep and bear arms equal to and greater than the standing army. 15.) The reason for crimes against civilians bygovernment or military personnel to be placed in local civil courts and triedby civilians. Not military courts. 16.) Affirms free trade. Inside as well as outside the US. The Government cannot tax us unless we agree to be taxed. ``Notaxation without representation". (Do not confuse representatives - persons- with that which is representative of that which is purchased with peoplesconsent. Remember, the colonists had British "representatives" who made decisions for them; this is what they fought against. This is a inalienable right as it is one of the original ``Bill of Rights"; and cannot be changed. The16th amendment of the Constitution is in violation of the original constitutionand the 17th Grievance of the Declaration of Independence. You cannot amend an inalienable right; and representation does not mean arepresentative as an individual, it means representation of the need by consent. General funds are unconstitutional as they do not pertain to a specific purposewhich has been dedicated by the people themselves by vote and individualconsent. This is why a general percentage tax derived from income, property or sales is unconstitutional. It makes it impossible to stop collecting when funds for a particular needare satisfied; and creates a bureaucracy that expends more money just toreturn over taxation back to the people.... If your ``representitives decideto give you back your money; or throw it back into a ``general fund" to spendwhen and where they want. This last problem is what expandsbureaucracies and dependencies of people upon government money, and shouldbe stopped for it is unconstitutional and extremely damaging to freedom andthe country.. 18.) Self explanatory. (see constitution for juryof peers encroachment) There are so many unconstitutional laws pertainingto private property that courts have become clogged with petty infractionsto laws which should never have been laws in the first place. The biggestinfraction is one person telling another what he should or shouldn't do withhis own property. Because of this clogging of unnecessary laws, thecourts have began developing ways for people to wave their right to a juryby trial to cut costs. Administrative law has been developed to bypasslaws that protect people. Administrative Hearings before court proceedingsforce people to travel burdensome miles from home prior to the final courtsproceedings. This practice is beginning to work itself into the entirelegal system. (i.e. small claims court, traffic violations etc.) This isa dangerous practice which could be greatly alleviated by reducing pettylaws and presenting laws that address only real crimes and not perceivedones. In a free country you cannot wave, sell or trade away rights. Rights are certain and inalienable. You cannot agree to arbitration, as you cannot freely give up your right to a jury by trial which is an inalienable right. 19.) Self explanatory. Not an issue at this time. A danger if UN charters impose laws on our country as well as other countries. 20.) Bureaucracies such as the Bureau of Land Management(BLM) as well as other large federal bureaucracies present powers withinthemselves. BLM now possesses armed rangers as well as legal enforcementof their own laws. They also have their own Hearings and Appealscourt in Virginia that proceeds all other courts pertaining to their lawsand issues of property within their jurisdiction. Most recently thisparticular bureaucracy is being used as a major tool to expand even greatercontrol over Federal lands through so called environmental protection causes. 21.) Self explanatory. Inalienable Rights... whichare Laws, our most valuable laws, are even now being abolished and altered.This is Treason by any who involves themselves in enforcing laws that ignore,over ride or water down inalienable rights. Our present federal governmentis constantly altering fundamentally the form of our government. They simplyrefuse to realize that freedom works. They place this country and its truedefinition of freedoms in peril. 22.) For suspending our own legislatures and declaringthemselves invested with power to legislate for us in all cases whatsoever. 22.) A problem where Federal Government tries to impose powers over State, and Federal and State over County jurisdictions. In this way the federal government would have nothing by which to bribe local governments. Ourpresent government is not the type of government the origionating foundersenvisioned, as clearly defined in the 37th and 39th Grievances (below) andin countless. 23.) He has abdicated government here by declaring us out of his protection and waging war against us. 23.) Here the national government has relinquishedthe power of the local governments and waged war against them. This happenedin the Civil War also by the Federal Government that refused to heed thefounders intent. It is continuing now through the use of financialmanipulation of corrupt taxation to withhold moneys from states and countieswhose is rightfully theirs to use as they wish in the first place, that willnot comply with federal measures. A dangerous combination when internationalagreements cause sway in our most valuable laws. 1. To relinquish (power or responsibility) formally. 24.) He has plundered our seas, ravaged our coasts, burnt our towns and destroyed the lives of our people. Notice they did not call them "terrorists". They later called them enemies and left it at that; `At war enemies in peace friends'. We should learn by this. Theonly reason to use such terms is to step around laws which normally restrictgovernments from invading the rights of its citizens. foreignmercenaries to complete the work of death, desolation, and tyranny alreadybegun, with circumstances of cruelty and perfidy scarcely paralleled in themost barbarous ages and totally unworthy the head of a civilized nation. 26.) No military should take up arms against its own people. No man should be pressed into service. A just war will find many volunteers. Ifthe purpose we went to war was to defend certain inalienable rights and thento establish certain inalienable rights in another country we defeat, therewould be no reason for a draft which is against established certain inalienablerights anyway. Wethen proclaim the installed European type government that does not recognizecertain inalienable rights as some form of freedom. The people still left under subjugation of their government. TheUN as it stands, can be used against its own people and countries practicinginalienable rights if the "international community decides" and is the reasonit should be disarmed and merely a room where nations debate real problemsand for which each nation will act on their own sovereign interests. Thisis also another reason for the citizenry to have equal or greater arms thanthe standing army as is defined in the 12th grievance. 27.) He has excited domestic insurrection amongstus, and has endeavored to bring on the inhabitants of our frontiers the mercilessIndian savages, whose known rule of warfare is an undistinguished destructionof all ages, sexes, and conditions. 27.) Self explanatory. *Government shouldnot sell (promote) its worth, or need of their services to us, our servicesto them, or to others sympathetic to that which insures their employment. We have fallen into the same method of warfare due to modern warfare weapons and tactics. Again, notice we did not redefine an enemy by calling them terrorists. 28.) Self explanatory. We also present these to the Federal Government. 29.) our repeated petitions have been answered only by repeated injury. 30.) A prince whose character is thus marked by every act which may define a tyrant is unfit to be the ruler of a free people. 30.) Defines character as a very important factor in the leadership of a free people. 31.) Nor have we been wanting in attention to our British brethren. The reason for the 17th Grievance. 32.) We have warned them, from time to time, of attempts by their legislature to extend an unwarrantable jurisdiction over us. 32.) The reason this web site is created. So they can make the changes that is their right and duty to make; individually or collectively. Thatis: to throw out all laws and imposing regulations not aligned with the Grievancesand rights of the Declaration of Independence. The excuse of just doing ones job, is no excuse to ignore ones duty to his country. If you know something to be adverse to the original Grievances, work to remove it; which is your individual RIGHT and your DUTY. ***Also- Work to make the UN simply a room for which independent countries can talkfreely; nothing more; and having no separate military or jurisdictive powersover other countries. This will keep any foreign, and indeed unwarrantable jurisdiction away from our free country. 33.) We have reminded them of the circumstances of our emigration and settlement here. 34.) We have appealed to their native justice andmagnanimity; and we have conjured them by the ties of our common kindred,to disavow these usurpations, which would inevitably interrupt our connectionsand correspondence. 35.) They, too. have been deaf to the voice of justice and consanguinity. 1. Of the same lineage or origin; having a common ancestor. 36.) We must, therefore, acquiesce in thenecessity which denounces our separation, and hold them, as we hold the restof mankind, enemies in war - in peace, friends. Establishes the right to separate from any form of government. Free and Independent states. Are you deaf ??? 39.) and that as free and independent states they have full power to levy war, conclude peace, contract alliances, establish commerce, and to do all other acts and things which independent states may of right do. 40.) And for the support of this declaration, with a firm reliance on the protection of Divine Providence, we mutually pledge to each other our lives, our fortunes, and our sacred honor. (Click here to See just what many of these men Sacrificed). 40.) ...our lives, our fortunes, and our sacred honor. All Debts contracted and "Engagements entered into", "before the Adoption" of this Constitution, shall be as valid against the United States under this Constitution, as under the Confederation. andthe Judges in every State shall be bound thereby, any Thing in the Constitutionor Laws of any State to the Contrary notwith-standing. What greater ENGAGEMENT is there of freedom, than the Declaration of Independence that establishes freedom! TheConstitution which purpose is to limit the powers of government, not to empowerit, is subject to the Declaration of Independence and the letters of theOriginating Founding Fathers of 1776 that define the intent of this writtenEngagement that is the founding document of true freedom. It is the ONLY document for which those who fought for freedom died and sacrificed for, there was no other. GeorgeWashington read it to his troops before each battle so that there was noquestion as to what they were sacrificing for. Nowherein history of the world or in the world today, is there such a document thatdefends against subjugation of governments and empowers the individual aboveany and all governments with certain inalienable rights, placing any andall governments at their feet. All other people are subjects to the governments of their own making. Donot make the mistake of confusing true freedom defined by "certain, inalienablerights" presented here as its foundation, with all those falsely proclaimed"free nations" such as England who have no such foundation. Signed by order and in behalf of the Congress. 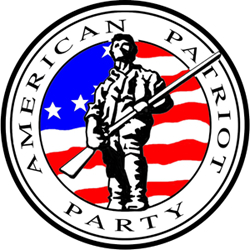 Declaration of Independence, American Patriot Party, Oregon Patriots Party,Patriot, Patriots, Patriotism, American Patriot, Patriot Party, IndependenceParty, State of Oregon, Elections Division. Freedom is more than simply a symbolsuch as a flag of which meaning can be changed with a ``democratic" vote,modern interpretation or a federal government or ``country" that preachesunity & peace. It is in fact ``a law that guarantees an individuals inalienablerights"; Life, to live where one wants to live and without harassment orcondemnation from others; Liberty to move about where one wants to move and live without regard to licenses, permits or zone requirements; And thepursuit of happiness that cannot be taken away by a so called ``democracy"or executive order or other ``grand plans" of others. Freedom is an absoluteguarantee of ``Certain" `` Inalienable" `` Rights" . ``AMONG"... ``these" are Life, Liberty and the pursuit of happiness. Further described ``Amongthese" are the Bill of Rights which are inalienable, unchangeable God givennatural birth rights; of which the constitution would have never been ratifiedwithout their inclusion.